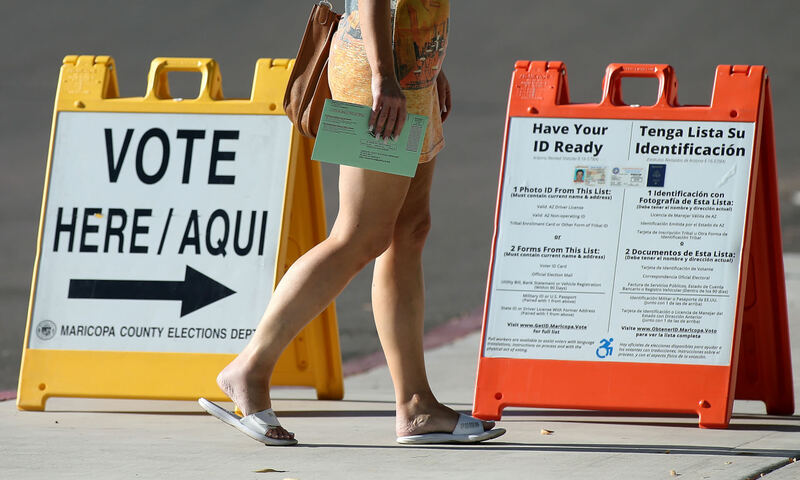 Senate Republicans advanced a controversial bill that would bar Arizonans from dropping off their early ballots in person at polling places, but GOP holdouts appear likely to stop it from going any further. Republican Sens. Kate Brophy McGee and Heather Carter were silent during the contentious, hour-long debate over Senate Bill 1046 on Wednesday. However, both said afterward that they will vote against the proposal, which will be enough to defeat it, presuming no Democrats break with their caucus to support it. Brophy McGee said she believes there are other Republicans who are also opposed to the bill. Republicans have a 17-13 advantage in the Senate, and can only afford a single defection on a party-line vote. Sen. Michelle Ugenti-Rita, R-Scottsdale, said she sponsored SB 1046 to reinforce the purpose of Arizona’s vote-by-mail system, to eliminate voter confusion and to reduce the amount of time it takes to count ballots. In November, the count wasn’t finished until 13 days after the election, and Ugenti-Rita said such long delays undermine confidence in Arizona’s election system. In the November general election, about 228,000 people dropped off their ballots at polling places on Election Day. That figure doesn’t include voters who dropped off early ballots in person prior to Election Day. The popularity of dropping off early ballots in person varies by legislative district. Voters in District 15, which Carter represents, and District 28, which Brophy McGee represents, have some of the largest numbers of voters who dropped off early ballots in person in November. Carter, R-Cave Creek, said she thinks people should be able to continue dropping off their early ballots. She noted the popularity of the practice in her district, where 12,310 people did so in November, more than all but three other districts. “I see that as I’m working the polls on Election Day. So, therefore, I support my constituents. I’m excited they’re out there voting. I want them to keep doing it,” she said. Brophy McGee, R-Phoenix, said voters in her district will feel disenfranchised if they’re not allowed to drop off early ballots in person anymore. “Whether they are or not, they’re going to feel that way,” she said. Brophy McGee, whose re-election was the last legislative race to be called in November, which she said was “agonizing,” said she doesn’t believe SB 1046 will solve the problem of long vote counts. She said the state should consider allowing county election officials to begin counting early ballots sooner. Ugenti-Rita emphasized that Arizona’s early voting system is supposed to be conducted through the mail. She said it’s a convenient system that allows people to simply drop their ballot in a mailbox. And anyone who doesn’t want to do that, or who doesn’t mail in their ballot before the deadline, can still vote in person. Under her proposal, voters who don’t mail in their early ballots would be able to cast a provisional ballot in person. “It’s extremely easy to vote here in Arizona. It’s just you need to decide, are you a voter who wants to vote by mail, or are you an in-person voter?” she said. Ugenti-Rita said the 2018 general election wasn’t certified until 20 days after the polls closed, which she noted has been a problem in previous elections, as well. Voters must sign the envelope that they use to mail in their early ballots, and election officials verify their identities by comparing the signatures to the signatures that are on file with the counties. That is a time-consuming process, and for ballots that are dropped off on Election Day, it doesn’t begin until after the polls close. Democrats took a different view of SB1046, saying it will disenfranchise voters and suppress turnout by making it more difficult to cast ballots. Sen. Rebecca Rios, D-Phoenix, said all 15 county recorders are opposed to the bill, and questioned why Ugenti-Rita would sponsor it without talking to them. Yavapai County Recorder Leslie Hoffman, a Republican, and a representative of Maricopa County Recorder Adrian Fontes, a Democrat, opposed the bill in the Senate Judiciary Committee, as did the Arizona Association of Counties. All said they do not believe it will speed up the counting of votes. Rios predicted that, if people can’t drop off their early ballots in person, it will result in massively longer lines at polling places on Election Day, reminiscent of the fiasco that occurred in Maricopa County during the 2016 presidential preference election. Like Ugenti-Rita and others, Rios pointed out that it took as long to count ballots last year as in previous elections, which led her to wonder aloud what the purpose of the bill is. She noted that Republicans led all statewide races on election night, but Democrats took the lead in several big races as the ballots were counted. Other Democrats said eliminating early ballot drop-offs could cause problems in rural areas, where the mail is slower, many voters rely on dropboxes for their early ballots and some people don’t have postal service at their homes. Sen. Lisa Otondo, D-Yuma, said mail in rural areas is processed through Phoenix, which increases the time it takes for early ballots to get to election officials and gives people less time to mail them in. Republicans rejected the notion that SB 1046 added new barriers to voting or made it more difficult for Arizonans to cast ballots. Sen. J.D. Mesnard, R-Chandler, said there is nothing in the bill preventing people from exercising their right to vote. He noted that people have 26 days mail in their ballots after receiving them. “We have confused the right to vote with convenience. It’s not the same thing,” Mesnard said. “The longer it takes to count ballots… the more people start to lose faith in that process,” he said. Having worked at voting centers in 2018, I frequently heard those dropping off early ballots (including those who did so well before Election Day) say they they don’t trust the mail system. One has to wonder if Ugenti-Rita has ANY data related to her seemingly seat of the pants decision to suppress the vote of early voters. Btw, don’t forget that no bill is truly dead until Sine Die.